As you may or may not have noticed, I’ve been on a bit of a health kick lately. Not only have I been trying to get back into a regular exercise routine, but I’ve also been trying to get the body of a Victoria’s Secret model when my husband isn’t around. The only problem is that, whenever I do anything more strenuous than typing out a blog post, I become hungry. And I’m not talking about the kind of hunger that can be satiated with a glass of cold water and a celery stick. Nope. I’m talking about the I-can’t-think-about-anything-other-than-eating-everything-in-sight kind of hunger that makes people devour an entire box of Cinnamon Toast Crunch in one sitting. Which kind of defeats the point of exercising in the first place, right? So I started Googling “healthy snacks”, and before I knew it, I had a list of 10 healthy FILLING snacks that can actually promote weight loss, and I’m no longer inhaling a family-sized jar of Nutella every afternoon. I’ve also been reading 50 Ways to Soothe Yourself Without Food by Susan Albers, and it’s teaching me a lot about how to differentiate between emotionally-drive hunger and actual hunger. I highly recommend it! My husband recently got me hooked on this tasty snack, but because it’s so smooth, creamy, and decadent, I always assumed it was more fattening than your average low-fat yogurt. But then I read this awesome article in the health section of U.S. News and discovered that Greek yogurt doesn’t just taste better than regular yogurt, but it also contains less sugar and more protein, which makes it a much healthier and hunger-satisfying snack when you have a case of the munchies. I have been hearing about all of the health benefits of eating almonds for years, but since they are so high in fat and calories, I have always been hesitant to eat more than a few at a time. But after reading about the health benefits of almonds over on Fox News, I am pleasantly surprised to find out they boost energy and immunity, lower cholesterol, AND HELP PEOPLE LOSE WEIGHT AND DECREASE THE SIZE OF THEIR WAISTLINE. 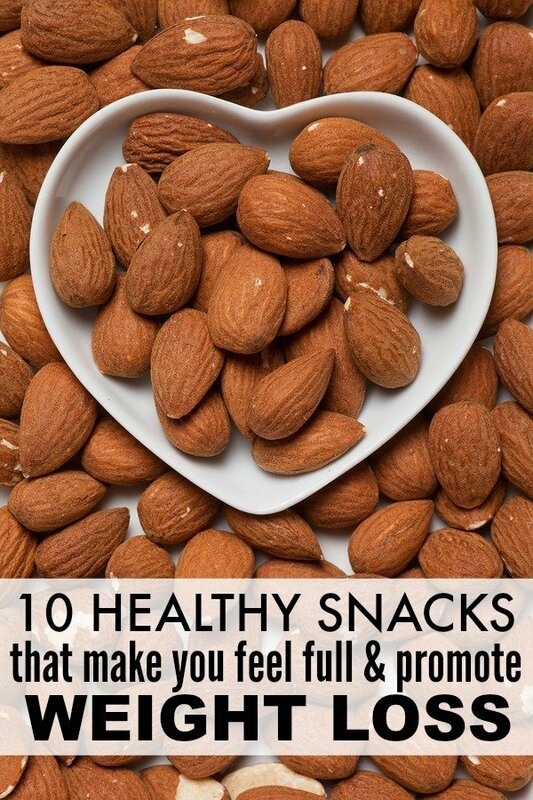 So skip the chip aisle at the grocery store and stock up on almonds instead! I’ve always loved carrot sticks (especially when they’re dipped in ranch dressing! ), and I recently discovered they are low in calories and high in fiber (which helps make you feel full for a longer period of time), and they also contain Vitamin A (good for skin, teeth, and bone health), beta-carotene (may protect skin against damage from UV rays), and Vitamin K (promotes healthy bones and helps reduce the risk of osteoporosis). Also? Carrots contain no fat. So why aren’t we eating them for every single meal??! For more information on why you should be making carrots a regular part of your diet, check out this helpful article in the Healthy Eating section of SF Gate. When I first read this article on Zee News about all of the health benefits of raspberries, I was shocked. Not only do raspberries help you lose weight because of their high fiber and low calorie content, but they also help reduce the risk of cancer, maintain cardiovascular health, enhance fertility, slow down the aging process, and help reduce depression. Who knew? We’ve all heard the saying, “an apple a day keeps the doctor away”, but did you know that pears are one of the leading sources of fiber from fruits? And since a lot of this is soluble fiber, it helps to keep your tummy feel fuller for a longer period of time, which is a fabulous thing when you’re trying to shed some weight. We all know that eggs are high in protein and important nutrients like zinc, iron, and Vitamins A, D, E, and B12 (right? ), but did you know you can lose up to 2 lbs a month if you eat eggs for breakfast? You can read all about how eggs promote weight loss, and all of the other health benefits of eating eggs, over on WeightLossResources.co.uk. I love avocados, but I rarely indulge in them because, in my opinion anyway, they are quite high in fat. But after reading this awesome article about using avocados for weight loss over on Healthiest Foods, I’ve come to realize that an INCREASE in monounsaturated fats (which are found in avocados) can actually help you LOSE weight. I’m serious. Read the article to find out why. We all know beans make you toot, but did you know that people who regularly incorporate legumes into their diets have smaller waistlines AND a lower risk of becoming obese? It’s true! You can read all about how beans can help you slim down for summer, and all of the other health benefits they contain, in this awesome article about beans and weight loss over on Shape. I bought a bag of edamame to try with my picky eater a couple of months ago and (SURPRISE!) she didn’t like them. So I threw them in the back of the freezer and completely forgot about them until I stumbled upon this article by Health Me Up about the health benefits of edamame. Did you know they’re loaded in protein and fiber (both of which made you feel full! ), and that they contain a lot of Vitamins A and C as well? Neither did I! For those afternoons when you’re REALLY hungry and a handful of carrot sticks, a hard-boiled egg, or a bowl of beans just won’t cut it, why not make yourself some oatmeal? Not only does it lower cholesterol and reduce the risk of high blood pressure, but it’s also been touted as the “best cereal for weight loss” by Women’s Health. Why? Because it can keep you feeling full for up to FOUR HOURS after you’ve eaten! If you found this list of healthy foods that promote weight loss helpful, please share them on Pinterest! And if you’re looking for more tips and tricks to help you lose weight, please follow our Health and Fitness board where we share all kinds of great ideas!